Author: Assibi Apatewon Amidu. Series edited by: Bernd Heine, Wilhelm J.G. Möhlig. 14 pp. Roman, 138 pp. The author of this book challenges the existing semantic assignment rules of Bantu classes. 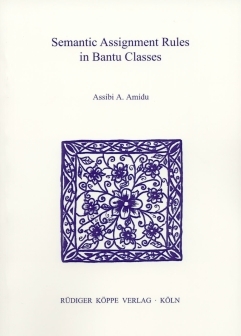 Many scholars argue that there is no better alternative or that there is no need to reanalyze, as the present work does, the Bantu class system and rules at all, but they seem to be unaware that these promoted semantic assignment rules are merely pedagogic rules which do not qualify as linguistic rules. They assume that statistical results about a taxonomy of concepts and categorizations are in themselves reliable guides to the determination of linguistic rules in a language. Furthermore, the focus on statistical or quantitative frequency in genetic and noun class studies draws attention away from the study of the qualitative functions and uses of nouns and noun phrases in their speech and written contexts among native speakers. Another weakness of traditional semantic and morphological assignment rules is the fast that it portrays the Bantu people negatively as an unsophisticated people with a simple out look on life. In the traditional world of semantic assignment rules, the Bantu appear to see the world in a childlike fashion without any degree of sophistication in the manipulation of their world. The evidence gathered in this study suggests that the Bantu world of classes, viewed through our reanalyses, is more complex and intricately interwoven than Bantuists are willing to admit. The present book provides the opportunity to reappraise the Bantu world and mind through a better understanding of the nature of semantic assignment rules in one Bantu language and to rediscover their underlying interrelationships with morphological rules. It is also aimed in modifying our views about the semantic categorization and conceptualization of the Bantu universe of reference and resulting in further reanalyses of the Bantu classes. In sum, Semantic Assignment Rules in Bantu Classes is a work that rightfully and forcefully argues against the danger of crude oversimplification in approaches to Bantu noun class semantics. It will be of interest to Kiswahili specialists and to Bantuists, especially those with a love for unruly linguistic facts. [...] the book is an important voice in the topic of assignment rules in Swahili classes, and Bantu in general. It intentionally argues against oversimplifications encountered in grammars and linguistic works. With a lot of major data it undermines the dogma of traditional noun class semantic systems. Without any doubt it should be of interest not only to the linguists but teachers of a language as well.